Disney's popular online community waddles onto Wiis for the first time with a collection of new mini-games in Club Penguin Game Day! As always, players create their own penguin avatar and then compete in a series of team-based competitions, including "Sumo Smash," "Java Sack," and "Fast Freeze," with an ultimate goal of conquering the most territory. 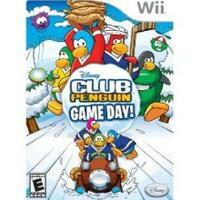 Gamers can earn exclusive items as they play through all 12 events, and players can save their penguin's accomplishments to their Wii Remote and transfer them to another system, or upload coins earned in the game to their www.clubpenguin.com account.